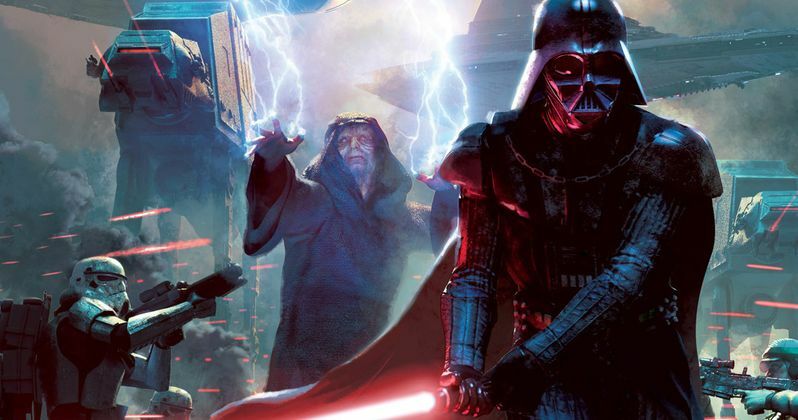 We can rule out at least a few fan theories heading into Star Wars: The Rise of Skywalker, as it's been confirmed that Emperor Palpatine is (or at least was) dead following the events of Return of the Jedi. One of the biggest surprises during Star Wars Celebration, which is just wrapping up down in Chicago, came not only with the release of the Episode IX trailer, but the reveal at the end of the trailer in the form of Palpatine's signature laugh. While we still have a great many questions, actor Ian McDiarmid has confirmed his character died. This may have seemed like a painfully obvious thing to say just a few days ago, but that trailer changed everything. That laugh changed everything. It's clear that Palpatine is coming back. The question of how, or in what capacity, remains to be seen. However, during The Phantom Menace 20th anniversary panel, Ian McDiarmid talked about a conversation he had with George Lucas about Palpatine's fate. Here's what he had to say about it. "'Is he...?' And before I could even finish the sentence. 'Dead, yes.' 'Well, couldn't he perhaps...' 'No. He's dead.' 'Well, wouldn't it be interesting if...?' 'Forget it.'" We already know that J.J. Abrams consulted with George Lucas before digging in on Star Wars 9, so surely he would have taken that into account. That opens up a whole host of questions. Does Palpatine get resurrected somehow? Is he going to become some sort of Dark Side Force ghost that we've never seen in the franchise before? At present, there are many more questions than answers. Fans will surely recall that Darth Vader threw Emperor Palpatine down a seemingly endless shaft near the end of Return of the Jedi, a fall that seemingly would have killed anyone, or anything. Just to be safe, Lando and Wedge successfully destroyed the second Death Star as well. But the Force works in mysterious ways and that could be the path to the evil character's resurrection. Fans of the Star Wars Rebels animated series may point to the episode A World Between Worlds, which, more or less, introduced the concept of time travel into the franchise. Ian McDiarmid actually reprised his role as Palpatine for that episode. We know from shows like Rebels, and from video games like Battlefront II, that the Emperor had been obsessed with collecting old Sith and Jedi relics. We also can point to the famous tragedy of Darth Plagueis the Wise from Revenge of the Sith, in which, it's revealed by thenSenator Palpatine to Anakin that certain Force users may be able to cheat death. The keys to Palpatine's return lie in there somewhere. Or maybe director J.J. Abrams has cooked up something entirely unpredictable, even for the most astute fans. We'll see how it plays out when Star Wars: The Rise of Skywalker hits theaters on December 20. This news was previously reported by Polygon.